Long-term management of complex sites begins with remedial design and includes all postconstruction phases of remediation management, monitoring, and evaluation of remedy protectiveness. At complex sites, long-term management may last several decades; projected time frames to meet site objectives can sometimes exceed 100 years. These long time frames increase uncertainties. For example, engineered remedy components can fail or underperform over time unless they are routinely maintained and modified. Systems designed for initial mass loading may not perform effectively if the mass loading changes over time. Furthermore, long-term performance and potential replacement of caps, slurry walls, and other containment technologies are assessed by monitoring and periodic evaluation of these components. 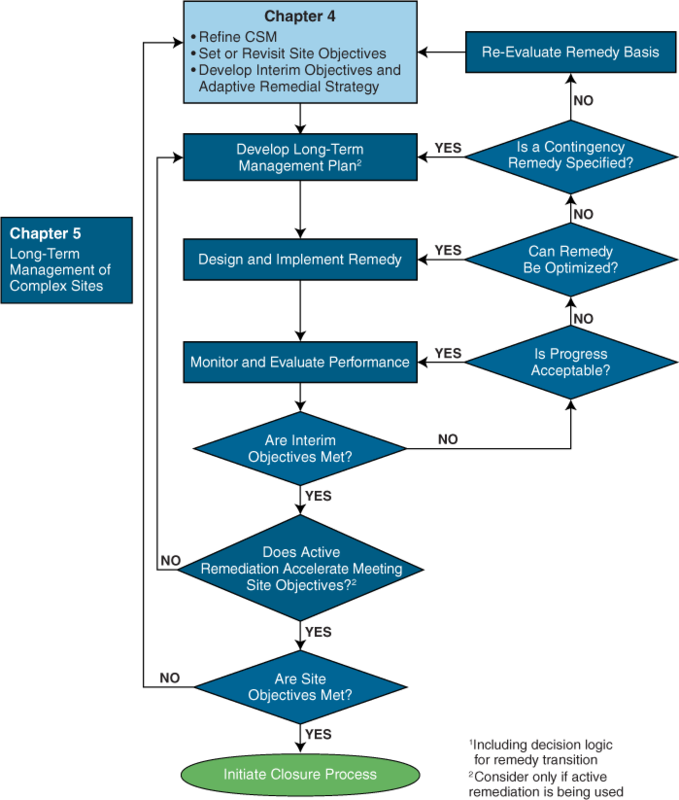 An adaptive site management approach can identify and account for these uncertainties over a project life cycle using a long-term management plan. This approach informs decision makers of remedy progress, expedites remedy reevaluations, and eases transitions to alternative remedies or contingency actions. As part of the adaptive site management of a complex site, decisions need to be fully scoped as early in the decision-making process as possible. These decisions and other key project evaluations are maintained in a long-term management plan, which is a living document that is revised based on periodic performance evaluations. Some states, including New York, require a long-term management plan in the environmental review process of Brownfield remediation sites. For CERCLA NPL sites, long-term management and its related costs and risks may be first considered at the FS stage and then further developed throughout the remedial design/remedial action phase. A long-term management plan can help achieve goals of protecting human health and the environment and making progress toward the site objectives. Because adaptive site management repeats the remediation potential assessment and remedy evaluation steps, decisions are based on the current CSM (USEPA 2011a) as well as the state of science and practice. As part of this iterative process, additional site characterization may also be performed under the long-term management phase. For example, additional site characterization may be performed if at any time data show unexplainable gaps, if contaminant concentrations are not decreasing as anticipated, or if new contamination is identified that requires additional investigation. Changing site conditions are charted and documented. These changes are evaluated to determine their influence on the remedy effectiveness, which is reflected in the periodic performance evaluations. The effects of ICs, such as deed restrictions that limit exposure to residual contamination, are also included in periodic performance evaluations. Figure 5. Long-term management flowchart. periodic evaluations (may supplement Five-Year Review reports at CERCLA sites). The planning process includes developing metrics for how remedy performance will be measured and evaluated, metrics for each major remedy component, and metrics for each interim objective. Planners can collaborate and agree on the interim objectives and performance metrics, then adapt the remedial design accordingly. Planning also includes monitoring and administrative controls of the site-specific infrastructure management. Using the DQO process, monitoring data are reviewed to evaluate system performance versus performance metrics and progress towards meeting interim or site objectives for the duration of remedial activities. Scheduled periodic evaluations compare expected to actual progress toward meeting interim or site objectives and reflect changes in the remedial strategy, site knowledge (such as the discovery of previously unknown contamination), or other changing conditions (such as changes in regulations).